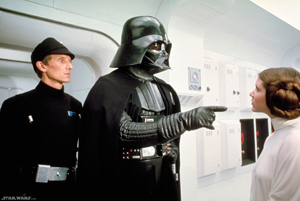 Martin McGrath talks to David Prowse about the benefits of being Darth Vader and why he believes performers should think carefully about protecting their future when they sign a contract. David Prowse, it seems, was destined from the very beginning to spend his acting career dressed from head to toe in black, wielder of a mysterious force. Certainly that’s how he got started on stage – lifting Kenneth Griffith from his death bed in a production of Don’t Let Summer Come at the Mermaid Theatre – long before, as Darth Vader in Star Wars, he became the galaxy’s favourite villain. His career as an actor followed time as a bodybuilder – competing in Mr Universe in 1960 – before becoming the British heavyweight weightlifting champion from 1962-64 and competing in the Empire and Commonwealth Games in Perth in 1962. He was working as a sales rep for a health and fitness company when Reub Martin, another bodybuilder who also ran Tough Guys stunt agency, suggested that there was always work in the acting business for someone of his formidable stature. Lucas had seen David in Stanley Kubrick’s A Clockwork Orange, in 1971, and he’d remembered him for five years. Now, putting together the cast for Star Wars, he wanted his man. Lucas had two roles in mind – Chewbacca, the hairy gorilla-like creature on the side of the good guys, and Darth Vader, the main villain. David turned down Chewbacca, partly because he didn’t want another masked role and partly because he thought that everyone would remember the villain. Star Wars went on to become one of the biggest movies of all time spawning sequels and spin-offs to this day. The movie broke new ground in the way it sold merchandising, creating huge profits and in subsequent years the film’s owners have proven themselves experts in manipulating every new medium to make vasts sums of money from the original films. David is keen to stress that he has no axe to grind with Lucasfilm or George Lucas, he was very happy with the bonus at the time and over the last 30 years the role of Darth Vader has been good to him, with public appearances, conventions and signings providing a significant source of income. But he can’t help feeling a little disappointed that, as his performance contributes to the creation of vast amounts of wealth, he has received relatively little. His advice to performers today is – take care with the papers that you sign and make sure that your contracts properly protect you for all eventualities. He feels it’s a little unjust that performers who did so much work to make the Star Wars films such big hits and whose performances are still being used to generate substantial profits haven’t shared in the wealth. Those fans clearly believe that David’s performances were central to the Star Wars films and, even more than 30 years later, they continue to appreciate his work and they’re still queuing to see the “man in black” – but perhaps the lesson that all performers should take from his experience is that you can’t be too careful about the contracts you sign.